First I’d like to thank all of you lovely girls for sending me such kind Birthday wishes, which has certainly contributed to my ‘Birthday vibes’ 😀 I had a fantastic day together with my lovely boyfriend who happens to be born on the same day like me! I’ve used one coat of 902 over two coats of China Glaze’s Liquid leather. I call this a glass flecked duochrome which shifts from purple to blue. As with all Ozotic’s the formula is great and easy to work with. When worn on it’s own it’s more lilac. Can’t get enough of Ozotic? Find them e.g. at Ninja Polish, Nail Polish Canada and Picture Polish! Pshhh… Have you entered my Birthday Giveaway yet? 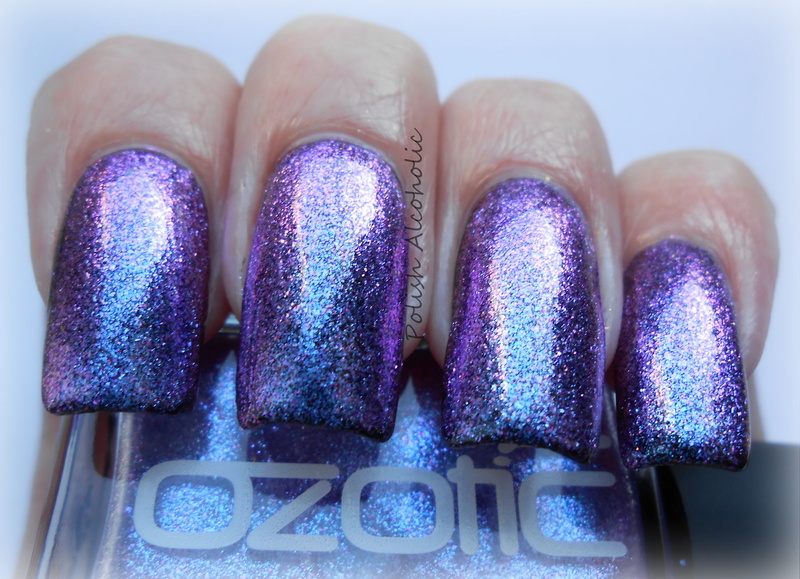 This entry was posted in Ozotic and tagged ozotic 902, ozotic sugar, ozotic swatches by Polish Alcoholic. Bookmark the permalink. And I agree, this polish is amazing! Wauw wauw wauw! Me likes! And I love this polish!